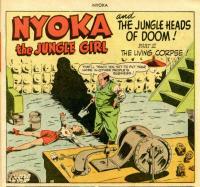 Cover (1 page) The Jungle Heads of Doom! Comic Story (6 pages) The Jungle Heads of Doom! 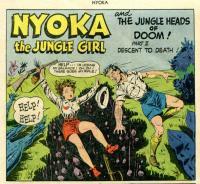 Part 1: The Jungle Menace! Comic Story (1 page) Should Be Hounded! Comic Story (5 pages) The Jungle Heads of Doom! Part 2: Descent to Death! Comic Story (5 pages) The Jungle Heads of Doom! Part 3: The Living Corpse! 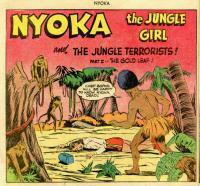 Comic Story (6 pages) The Jungle Terrorists! Part 1: Triangle of Hate! Comic Story (1 page) Nothing Doing! Comic Story (1 page) Ugly Truth! Advertisement (1 page) Red Swift Outfoots the Champ! Comic Story (5 pages) The Jungle Terrorists! Part 2: The Gold Leaf! 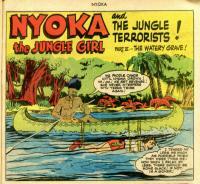 Comic Story (5 pages) The Jungle Terrorists! Part 3: The Watery Grave!